This year has been an incredible one for Martine and Guillaume. In early 2018 they were looking for a new challenge in their life when they found Mellowood Vineyard. They both went to work renovating the tasting room, connecting with the wine community and the vines themselves on this picturesque and amazing land. During this time Martine became pregnant and their biggest joy was added to their life! Sophie arrived, December 1st, after a great harvest and with all the wine in the barrels for the winter! Sophie has great genes. Her dad is French and Mom is of Italian descent. Her future will surely include amazing food, a family full of love, and, when she’s old enough, some fabulous wines from Mellowood. Guillaume is already planning to bottle magnums of the Mellowood Estate Zin 2018 to age for his daughter. Winter in the cellar is an important time for our winemakers. As Guillaume often says, “Wood is like the spice of the wine.” Making wine can be compared to cooking food. If you over-season a recipe, the delicate flavors disappear. So deciding the amount of new oak or the type of barrel to use for aging is crucial to preserving balance. Guillaume always looks for balanced wines that are the ultimate expression of the land. Less than 30% of the barrels used are new oak, used to stabilize the colors and when necessary add some structure. At Mellowood we have decomposed granite, acidic soils, so the vines will produce fruity and acidic wines, and we want to highlight this flavor in our wines. 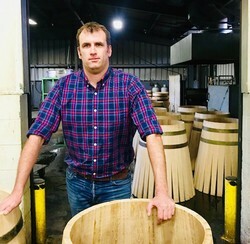 Guillaume this year has selected a few different types of both French and American oak barrels. The French oak has a tight grain so that wine will have fine tannins and a subtle impact of the oak. Fresh wood, fresh hazelnut, dry fruits, toasted brioche, grilled almonds and tobacco are the type of flavors that usually result from French oak. American oak enhances the wine with flavors such as coconut, vanilla, cinnamon, toffee, and cocoa. This type of barrel works well for Syrah and Zinfandel. The wine will age for more than a year, where it will soften and integrate the tannins of the oak. It will be ready to drink by 2020. This is exactly what wine professionals—those who make, sell, buy, and write about wine—are able to do. For any wine enthusiast, it’s the pay-off for all the effort. While there is no one right or wrong way to learn how to taste, some “rules” do apply. First and foremost, you need to be methodical and focused. Find your own approach and consistently follow it. Not every single glass or bottle of wine must be analyzed in this way, of course. But if you really want to learn about wine, a certain amount of dedication is required. Whenever you have a glass of wine in your hand, make it a habit to take a minute to stop all conversation, shut out all distraction and focus your attention on the wine’s appearance, scents, flavors and finish. You can run through this mental checklist in a minute or less, and it will quickly help you to plot out the compass points of your palate. Of course, sipping a chilled rosé from a paper cup at a garden party doesn’t require the same effort as diving into a well-aged Bordeaux served from a Riedel Sommelier Series glass. But those are the extreme ends of the spectrum. Just about everything you are likely to encounter falls somewhere in between.